You will not be judged on the views or attitudes you express. Purposefulness of organisation – each sentence has a reason for being there. Length of sentences, use of conjunctions. Your opinion is not important, it’s how you communicate it that counts. 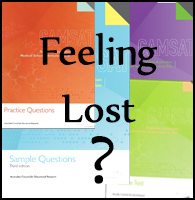 The GAMSAT is not a test of knowledge, and section 2 is no exception. You won’t get extra marks for including lots relevant ‘facts’. Although task B is often referred to as the ’emotional’ essay, don’t fall into the trap of being overly dramatic. You don’t get points for simply feeling strongly about something. It should only be long enough to acomplish what you set out to say. If you can say something as clearly and effectively in less words then do it. It saves you time and it saves them time. Short sentences are easier to read. ACER asks for depth, not breadth. Don’t inundate them with ideas. Just show that youve thought about a small number of them deeply. You don’t have enough time to talk about everything. Also beware of broad overarching generalisations, no matter how much empirical evidence you can cite to support your claims.